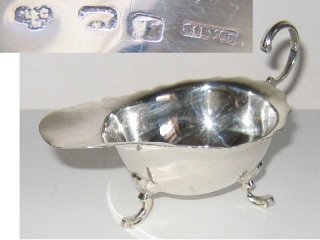 This sauce boat was made in Calcutta (India) by Hamilton & Company, which was established by Robert Hamilton and others at the beginning of 19th century. Due to the fact that the British regulation on hallmarking was not in force in the British Colonies, immigrated silversmiths were use to mark the silverware with their trade mark and a series of pseudo-hallmarks similar to those used in England and Scotland for sterling silver. Marks, struck in line on the body: H & Co Ltd. (trade mark of Hamilton & Company Limited); an elephant, a roman capital I (date letter for 1945 or 1970) and the word 'silver'. The sauce boat is of very good gauge and mainly hand made. 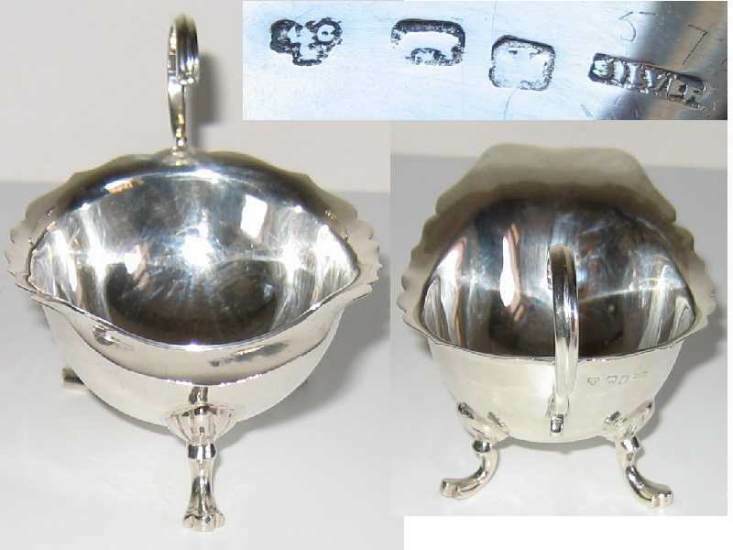 It is not clear if at the date of crafting of this salver, silversmiths working in India were using the former alloy of 916/1000 purity or the sterling standard like in the U.K.